The first time visit a hospital as a Disney VoluntEAR. Mickey, Minnie and I walked in the door with toys in hand. The smiles we witnessed were priceless. I could see that the young patients were able to forget their worries — even if just for a moment — and be kids again. 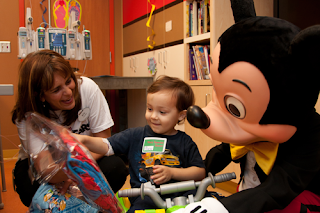 One of the ways Disney extends that happiness beyond regular hospital visits is by sending toys, DVDs, books, sleepwear and other items to hundreds of hospitals each year. This month, more than 600 children’s hospitals around the world will receive Disney care packages. From Club Penguin memberships to Marvel action figures, Disney Princess dolls and beloved Disney movies, the packages help bring smiles and laughter to more than 200,000 kids. The items in each care package help promote therapeutic play and provide a sense of comfort and normalcy to children during their hospital stay. Delivering care packages to hospitals has been a Disney tradition for nearly 10 years. To ensure the right mix of products to donate, Disney partners with Child Life Council – an organization that helps identify the most desirable products for the hospital environment. After all, promoting the happiness and well-being of kids and families is at the heart of what we do at Disney every day!